Dstv days are numbered with such competition, I only pray that consat should be able to add sports channels that will be showing live English premiership matches. Comment *Hi Mr. Morgan, Please How Can I Get Your Liberty Decorrer.??? Please If You Have Now, I Need Two. And You Can Contact Me Through My E-mail: daudasluti@gmail.com THANK YOU. @Dauda Shuaibu: what will you use a liberty decoder for? @fORD; YOU NEED TO CONTACT CONSAT CUSTOMER CARE SIR. pls how can 1 get consart free ? @beso, 16.0e is facing up and East. Please if you are not an installer. I will sincerely advice you not to try tracking any satellite frequency yourself. Please call an installer and pay for his service. qsat 11g, can u list them? Pls Mr Morgan, My Qsat will xpire soon. What can I do? sir.lemmy. . . .can i get avatacam hd acct 4rm u? @alaya, you can get it through me sir. sir.lemmy,pls my qsat 11g just got burnt through electricity,is it still repairable? Kindly drop the frequency and symbol rate for us. This is actually a very good competition against DSTV. Getting channels to show EPL on the Consat platform is an ongoing process which doesnt come overnight. The licence given to DSTV to show EPL hasnt expire yet. Untill then will the competition be stiffer. Hi mr Lemmy greetings.pliz is Dqcam working on q sait 11g? pls mr lemmy, can u do the house a favor cos i know that majority of the house does not know how to interprete lyngsat.com data. i personally doesnt understand their data. so pls educate us.i hv done some research on google about it to no avail. i,ll appreciate if u can help as soon as possible. 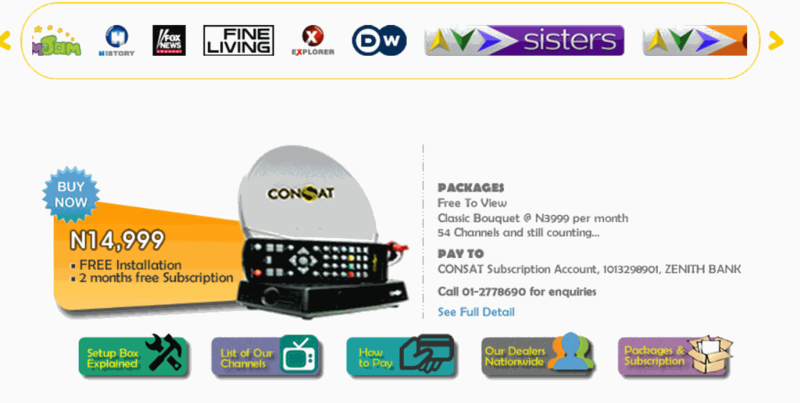 About consat, some chanels like tvc news,tvc ent,kenis music,aljazeera etc are working with strong decoder. itz good anyway. @livnet lyngsat.com is for installer you can search for any satellite on it and you will get its frequency and location. With my qsat I can watch tvc news, consat info. I have tiwantiwa,eurosports, tvc yoruba, tvc nollywood, infact, all the consat channels. But all of them are not showing. Why? @tosan but it has more news and entertainment channels than dstv and mytv combined together can’t you see that? is it available in jos¿? hello mr. lemmy, this my first time of posting on this site and it will be very bad of me not apreciate all I learnt from this site. so therefore I say a big “THANK YOU AND GOD BLESS”. please I have a little question to ask you. is it possible to track ‘badr4’ with a 60cm dish?. coz I have tried to no aveil. and if no please can u mail me the minimum dish size to my email address thank you. Please this does not worth the effort of reading it, this is because there is no special channel among the listed. Can i use strong decoder for consat? let me ask, in Nigeria do u instill watch analog tv channel or move to digital channels. b’cos u people are advance. Thanks for the info broda, i blind scan my Qsat saw all those channels but non of dem is showing just scramble. Anyway thats a good fight for DSTV if consat can meet up their target of the EPL.EPL makes DSTV a big head. hi great work u are doing in educating us thanks. Pls I have a dove decoder and I want to renew the account can u help thanks . How can we track it using a strong decoder? Can we turn our dish to Eutelsat 16A at 16.0 degree to open by qsat decoders.